The food and beverage industry faces major challenges. These include increasing product diversity, shorter product life cycles, fluctuating order quantities and stricter statutory regulations particularly with respect to hygiene directives, just to name a few. Continuous improvement of production processes and efficiency increases cost savings, optimises profit margins and above all guarantees competitiveness in the long term. The basis of this is data transparency within networked production, which is easily achieved with standard automation technology. Automation can substantially contribute to the long-term sustainability of new systems, as well as systems which have been expanded over the years. Mitsubishi Electric offers a wide range of solutions and services for the food and beverage industry. Solutions range from the automation of simple inverters for controlling dough mixing applications that can improve Overall Equipment Effectiveness (OEE), to robot technology for increasing productivity. Production, energy and quality data can be communicated continuously and easily using the MES-IT interface module. In order to do this, production data and test results are recorded during each stage of production, from individual processes to whole production operations, and transferred in real time directly to higher-level systems. 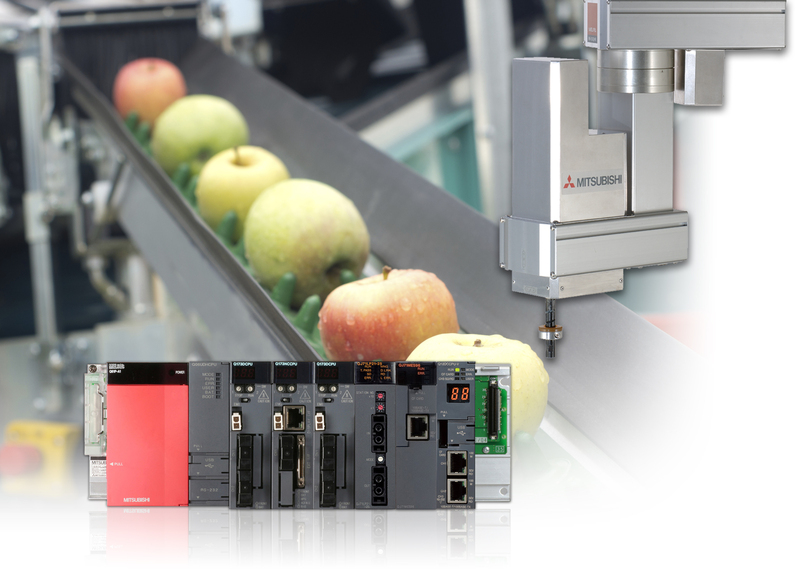 From batch control to 'food safe' robots, from energy management to direct reporting in to your ERP systems, you can be sure that Mitsubishi Electric has the solutions and flexibility to be your automation partner. Take for example the use of robots in the production area. Robots can be ideal, for instance, in Pick-and-Place applications. Mitsubishi Electric robot technology helps to increase system flexibility and availability. If several products are manufactured, packed or manipulated on one line, production cycles can be designed to be substantially faster and more cost efficient with space-saving robotic and camera systems. At the same time the high hygiene requirements of the food and drinks industry are met. The optimising of machine running times by preventative maintenance is also a major issue in the food processing industry. If a machine suddenly fails, an entire batch is usually lost. This is expensive and damaging to productivity. Modern control platforms, touch screen operating devices, like the Mitsubishi Electric HMI GOT2000 series, and sensors with comprehensive, integrated functionalities as well as flexible maintenance concepts like MAPS, the Life-Cycle-Software solution from Mitsubishi Electric, provide the necessary data transparency for simple implementation of preventative maintenance concepts. Stefan Knauf is Corporate Account Manager Food & Beverage, CPG, Mitsubishi Electric’s Factory Automation - European Business Group.